But above all, a blogger is a writer. The Internet is overflowing with blogging tips. Today, we sift through the noise, mix a few metaphors and focus on the essential oils – the writing! So, for a good blog – no, for a great blog – read on. Write the title for humans. Humans want to know what is in the article or what they will get out of it before they invest their time reading it. Titles like “A peacock’s lament” might be cute, but not for a business blog. A title like “Cheap hotels Melbourne” might be keyword-rich, but does it sound like the rest of the text will be of good enough quality to read? Write the title for the search engines. Yes, include some words that people will search for. Why not? That’s how you get readers in the first place. Just remember when you write your title, don’t sacrifice human visitors for robots. You need the people more than the search engines, and human sacrifice is illegal, anyway. When you write your title, don’t sacrifice human visitors for robots. Human sacrifice is illegal. Include numbers in your headline. People love these. It somehow helps people quantify what they’ll be getting. 99 writing tips for bloggers is quantifiable. Take the number away, and it feels vague and unclear. Try writing a contrary headline. I could have written 99 ways to alienate your readers, and written the “fail” version of this post. If it fits the topic, adding “How to” at the beginning of the title can increase readership. You might try adding a sense of urgency or scarcity to the title, as is often done on sales pages, to get readers to take a look. Try to keep your headline under 65 characters, so that the full headline shows up in search results.Make sure the text of your blog post actually delivers on the promise of the title. If it doesn’t, better rewrite that title. I often do. 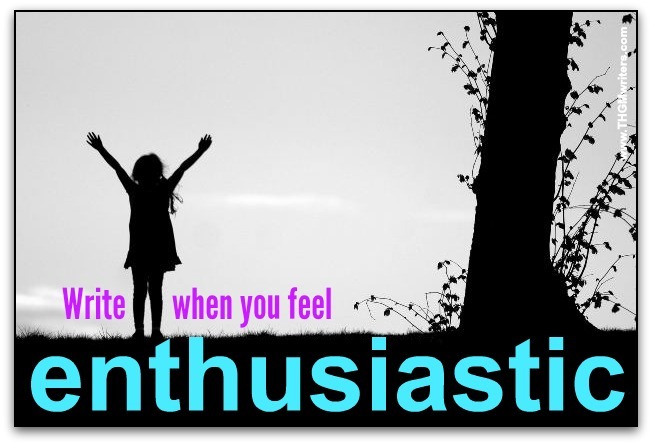 Write when you feel most enthusiastic. Your posts will bubble over with exuberance and personality. Your readers will be infected with your enthusiasm. Make sure there is a good summary of what to expect in the blog post right up front. My writing style doesn’t really allow for this, so I go back and write a subtitle-style intro paragraph at the beginning of each post. This summary helps readers decide to read on if they are only marginally convinced by the title, and it provides a summary to show up on social media when the post is shared. Write for yourself. This might sound counter intuitive, but if you write for yourself, you will come across as genuine. Your readers will appreciate it. Yes, choose topics your readers will want to read and cove the points that will be helpful to them. But write for yourself. Don’t try to impress your readers. Try to inform them. Try to convince them. But if you try to impress them, you’ll lose your voice and your personality. “Write drunk, edit sober.” Hey, that’s Hemingway’s advice, not mine. “Write with the door closed, and rewrite with the door open.” That’s Stephen King’s. Right, we’ll stick with Hemingway then. Write as often as you can. If you don’t want to publish more often, try guest posting elsewhere. Even better, write a spare post whenever you have a moment. It doesn’t hurt to have something in your back pocket when the week gets too busy to write. If you are describing a process, show what you mean. Include photos, screenshots or video to help explain the process. Think before you write. You might want to prepare an outline before you start. Pay close attention to the best comments your readers leave. They are telling you what to write about next. Pay close attention to the comments your readers leave. They are telling you what to write next. Do I have to say “Use proper grammar?” You’re right, I do. Use proper grammar. Do I have to say “Use proper spelling?” You’re right, I do. Use proper spelling. Read. The more you read, the better you’ll write. Be careful not to make untrue or exaggerated claims. A reputation, once lost, is not an easy thing to reclaim. Whenever possible, link to the source of your claims. This gives you credibility and makes everything else you say smell more believable. Whenever there is more to the story than you want to tell, link to a source for further information. There will always be newbies who need explanations, and you don’t want to bore the more experienced readers. And sometimes there is a lot of background information that experienced readers will also appreciate, but you don’t want to get bogged down in background discussions. Link to your other articles whenever they are relevant. Readers will be interested in what you have to say on related topics. If you quote from someone, link to their website and/or social media profile (Twitter is usually best). Don’t be a link-Scrooge. Nobody likes link-Scrooges. Don’t use anonymous sources. If it’s important enough, get someone to speak on the record. Be precise. Edit your post before it goes live, and replace anything vague with something more precise whenever possible. If you add questions, people just might answer them. A question can be a very powerful way to end your post, leaving readers with something to respond to in the comments. The thesaurus is your friend. Find the best word, not just the first word that pops into your head. Choose the words your readers would use in daily conversation. You can’t go wrong communicating with your readers in their own language. Try closing your eyes while you compose a sentence, and see if it comes out sounding better. Engage all senses. Fiction writers do that all the time, but your blog posts will be more exciting if people can taste and smell what you are talking about, too. Use analogies and metaphors, such as when I wrote how to write like a caveman. Sometimes each paragraph is a different point in a list of topics. Number the paragraphs or name the topic in bold at the front of the paragraph. Capitalize only proper nouns. This is English, not German. The toilet is your friend. Great place to work over an idea, and if you keep enough magazines there, a great place for inspiration. Spy on other blogs in your niche. They have some juicy topics that you might just want to copy. Er, imitate. Er, sincerely flatter. Spy on blogs in your niche. They have juicy topics that you might just want to sincerely flatter. Don’t just copy other bloggers. Nobody likes an illegal alien shadow. Don’t plagiarize. That could get you hung, shot, boiled in oil and run over by a truck. Or worse. Spy on other blogs in your niche. You might find some juicy ideas they left out. Spy on other blogs in your niche. The comments their readers leave are telling you what to write about next. SEO optimize your blog post. Don’t over-do it. Humans have to come first. But make sure to use the terms people will search for at least a couple times in your text. If you can’t do that, your post is probably not really about the topic you are writing on (say that 11 times fast). Don’t save all your text for text. Sure, it’s fun to write on a white page. But the joy in life is to scribble on photos. And pics with text on them tend to attract more attention on social media. Be consistent. Once readers get used to your style and language, they’ll probably want you to keep writing that way. It’s your blogging personality. It’s how they get to know you. If you allow guest posts, make sure to follow the same writing rules as on your own posts. The style can be different, but the structure of the posts should be the same. For instance, I would still include a subtitle-style intro paragraph at the beginning of each post. Make every word count. Cull the fluff. Make it personal. No matter how “businesslike” or “professional” you want to sound, people like interacting with humans, not corporations. Make it feel like they are reading something written by you, not by your evil twin robot. Don’t write just about your products and services. You know the guy at the reception who is always talking about his business as if there was nothing else in the world? You don’t want to be that kind of blog. Include references to your products and services subtly whenever it makes good contextual sense to do so. This is called “product placement”, and it’s even acceptable in Hollywood. Make it timeless. Once something is on the Internet, it lives forever. Create timeless posts that will bring you and your readers value long after World War 17 has decimated the planet. Make it newsworthy. If everything you write is timeless, you’ll never get ahead of the news. Hop on a trend, do some news-jacking and get your readers whipped up in a Beatlemania-style frenzy. Get to the point. Don’t make the reader suffer while you skate around. Make cultural references. Unless you really want to sound like a stuffed suit with starched underthings, try to fit in some references to popular culture – movies, songs, sports, celebrities, holidays – into your writing. This makes you and your message more approachable. I often make reference to Doctor Who, and I have referred to a number of movies on this blog over the years. Break up long paragraphs. Nobody likes a paragraph that doesn’t know when to shut up. Break up your wall of text with images, video, tweetables and any other media you can think of. Break up your text with compelling subtitles. Inevitably, many readers will skim down the page. Every subtitle gives them another entry point to return to reading. Try to use bullet lists at least a couple times in your post. It helps break up the text and make it more readable, and people just naturally like lists. It gives people a feeling that they are getting more information for less reading. One sentence paragraphs are cool. People like variety. Make sure to vary the length of sentences and of paragraphs. List posts always seem to be popular. This is a list post. Quote from experts. It gives your article more authority, and if you highlight the quotes in a call-out box, it also helps visually break up the text. Give others something to quote from you. These days, I am doing this through the Click to Tweet tweetables. Use examples. Examples make your message more real and give it more authenticity. Use case studies. Case studies are like examples, but with a lot more detail. These are especially useful when you want to paint a detailed picture of what was done, what the results were and what was learned by the experience. Tell stories. Everybody likes stories. Include a Big Bad Wolf – they are always popular in stories. If you can’t fit in a wolf, don’t worry. I don’t have wolves in any of mine (although I have a cat in one). Include data. Depending on your topic, data can help add credibility to your post and also make it more real and factual. Bonus points for visualizing the data in a graph format. Don’t count your words. No, your blog post does not have to be over 2,000 words or over 3,000 words, or over 500 words or any other arbitrary length. Write the length that makes sense to cover the topic in the level of detail you wish. Think of your post like a miniskirt – long enough to cover the topic, but short enough to keep things interesting. Get help. When you don’t have all the examples or are not sure of all the points to consider, throw open the question on MyBlogU. You’ll get help from other bloggers who have something to share. Join Toastmasters. You’ll be surprised how learning to speak better will make you learn to write better. Avoid jargon and acronyms. There will always be reader who will feel left out. Answer the comments. You don’t have to answer every single comment. Some bloggers do, and that’s fine. But some comments don’t require an answer. However, if you don’t respond to any comments, you’ll have a pretty low level of engagement. Write in the active voice, rather than in the passive. If you don’t know what the active and passive voices are, take a class in English before you start blogging. Address the reader. A blog is no place for the third person. Make sure your text is highly readable, ideally at a grade 7 or grade 8 level. You can test it before you publish at http://read-able.com. To make your blog more readable, split run-on sentences. To make your blog more readable, use smaller words wherever possible. Build on previous posts. Regular readers will appreciate the continuity and the progression. Don’t be afraid of controversy – that will increase both readership and interaction – but always be extremely respectful of opposing views. And if you feel like it, be respectful of concurring views, too – why not? If you guest post on another blog, wait a couple months, then rework the post, adding some new information, some fresh examples and perhaps a new angle, and make the topic come alive on your own blog. Turn a conference presentation or training session into a blog post. Why not? Recycle and transform content for your blog. Ask your staff to write posts. That include call center employees and counter staff. Ask them questions, and when they reveal something profound about customer experience – Bingo! Sure, you’ll have to edit for style, but the raw information could be gold if you are willing to run with it. Include a call to action. Don’t leave reader to wander aimlessly through the Internet without direction. That’s just cruel. Try to write a day early. I always edit my posts after at least an overnight break. Remove weasel words like “maybe” and “sort of” and “generally” and “often” and…I really should follow my own advice on this one more often. Image titles and subtitles can be cool, but remember that the search engines can’t read them. Write with a cat on your lap. The purring is soothing and calming and…wait, no. I already said to lock out the cat and to write when you are feeling enthusiastic. Remember to be useful. Even editorial style posts can often leave readers with something actionable. Always keep a notebook with you (Wait, let me take note of that!) because ideas will come at all times in all places. You won’t use all your ideas, but some of my best ideas have come while I’m driving, in bed at night, in the shower – all the places that notebooks don’t go. Read your draft to your grandmother. If you lose her, you might lose some other readers. Do you have a style guide? The CIA has one. Maybe you should have one, too. Proofread. Proofread. Proofread. Proofreed. Oops. OK, question time. Is there anything here that you disagree with? If so, let’s hear it (respectfully) in the comments. Did I miss anything? If so, let’s hear it (respectfully) in the comments. Did you really like the post? If so, let’s hear about it all over social media. Your challenge: Can you build a great blog post on your own blog based on one or more of these tips? Wow!! … this is an epic post on writing tips! These are all of the best tips you can learn to become a great writer. They are simple, but yet so powerful when implemented correctly. One of the best tips, that has helped me become a better writer, is to read and write like a maniac. The more you read, and the more you learn – the more you will have to write about. And the more you write, the better you will become at it. Words will just flow out of your mind, through your fingertips. This is a great and very valuable list, David! These are indeed essential writing tips for blog writers. All of us can use this as a source of information if we fail to remember some important things in writing. I will totally bookmark this post and share with others. I was caught off guard with “Your blog post should be like a miniskirt, long enough to cover the topic, short enough to keep things interested.” that is totally right. It made me laugh and smile since it is spot on. haha! Proofreading your work is important. Revisions are needed if you believe your work looks incomplete or puzzling, “Read your draft to your grandmother. If you lose her, you might lose some other readers.” is a perfect tip for that. All in all, I couldn’t get enough of this wonderful list, David! You are always awesome! Thanks for this! The best part, is that grandmothers usually have the time to spend with you, and just the fact that you share with them what you are doing pleases them to no end! I commend your effort in putting this list together to make one powerful useful information on getting better as a writer. You’ve definitely put out many of the best tips out there that can over-time move a newbie writer to become one of the best author of our time. What I have discover over the course of writing for my blog in the past three years to become better at writing is to read a lot, I mean reading what really matters to your goals. Read top blogs in your niche and take what is best in their pattern to shape your own writing skill. However, like everything in life, there is no set or laid down rules to become a better writer……the only rules I know of are the ones you set for yourself. No rules, Shamsudeen, just guidelines. I have learned in life that many rules can be broken once you have learned how to follow them. WOW !! Such a huge list it is..and each and every point is important as well.. I’m sure with this your guide I’m now able to attract my readers in a more sufficient way and for long time as well. I must say you have really did a detail research before writing the post I’m so extremely shocked to see.. great work..
You yourself don’t know how much help you did by writing this single post ! Great work. ! Thank you so much for putting all together in this post 99 tips for the bloggers! This guide will give what all needed to create a fantastic post. I so thankful to note that Philipscom too in mentioned in the viral post! Thank you once again for this great service! This is an awesome post. The tips are indeed essential and so direct. Many people are sure to benefit from them. The quote”Just remember when you write your title, don’t sacrifice human visitors for robots. You need the people more than the search engines, and human sacrifice is illegal, anyway.” sums up the essence of writing for humans as well as the search engines. What more could one need as a “writer” or “blogger” after going through these tips. * “Write drunk, edit sober.” Hey, that’s Hemingway’s advice, not mine. * “Write with the door closed, and rewrite with the door open.” That’s Stephen King’s. Right, we’ll stick with Hemingway then. You had me at 99 essential tips. When I reached the Blog post I really was not disappointed. You’ve written content for Humans, which beautifully succinct, and does add so much value to all levels of Bloggers, new ones and old. Your analogy of a Blogger wearing multiple hats (Edward De Bono I presume) is spot on. It was almost like someone held a mirror to my face. Too few people (me first) write a Headline and then take a step back to figure exactly what sort of connotation the head line will raise up in the readers mind. Cheap Hotels Melbourne conjures up seedy, flea bag hotels in Melbourne where the sheets are changed one a year :-). Keyword rich, search engines ecstatic, Human compulsion to read (next to) zero. Your comprehensive guidelines for Headline creation awesome. The advice to write when one is enthusiastic a little GEM. In you I notice a kindred soul. Not many would admit to having their best ideas while on the throne in the loo. I’ve had a multiple Ah Ha! moments there myself and can truthfully support its efficacy. I’ve noticed a teeny tiny spelling error in one of your links David. I use almost all your tips when I create content for my Blog. Glad to get validated. This Blog post was hands down terrific. Huge body of work. I salute you David. Thanks for sharing. I came to this Blog post from linked on Kingged. I’ll fix that typo; no matter how many times I proofread, some word has to play a prank on me. This was a great list of writing tips and I can pat myself on the back for following a lot of these tips. The way that they help me can definitely help others. One thing that I struggled with is trying to write my headlines within 65 characters. You really have to use your brain power when it comes to some subjects. For this, I use Coschedule’s headline analyzer to help me out. Some years ago, I got the idea of writing a summary at the top of each of my blog post. This helps me to stay focus as well as it helps the readers to see what the post is going to be about and make an even further decision of whether to read the rest of it or not. Also with some case studies, I’ve started this year to link back to the resources I got my information from so that my readers can also look them up. And finally, I try not to write at my readers but making it more conversational. If there’s an opportunity, I will put in a story or an analogy so that the subject can be more entertaining and comprehensible. In this sense, it gives my audience the reason to come back for more content. I love hearing how you built your writing skills, because that’s to a large degree how each of us has done it – one “Aha!” moment at a time, followed by an improvement here and an improvement there. Good show! Great tips! Such a useful list! I usually read my post out loud before posting them and you’re right mistakes scream at you! Its a great list but couldn’t help laughing at the final image…that is so funny…but true. Thanks for sharing these useful tips. It’s a bumper list! Headline writing can be tricky. I like using a headline analyzer tool to rate my ideas. It’s always good to brainstorm multiple headings, so I aim for 5+ per post. The tool from Coschedule is worth a try. It’s also good to see which content is popular. BuzzSumo is a life saver in this respect. You can search by keyword or domain and view the most shared articles. This is a great source of inspiration for future posts. You can also find interesting content ideas by search by hashtag on Twitter, or checking out relevant forums/subreddits on the same topic. Research is key before writing! I’m also a fan of using imagery and infographics etc. to break up the content. Text heavy posts can be a little daunting, so I always try and include something slightly easier on the eye. Everything I’ve ever read about blogging (I think) all in one place. Thanks! Nice to go through the tips once again. recently updated blog post at #Philipscom. I am sure the philipscom readers will appreciate reading this indepth note! Thank you so much David for your great writing tips. I already knew some of the tips but majority of what you mentioned are new to me. I can now apply these tips in my blog. Thanks again.